China’s steel industry is perhaps the most important fundamental element of the demand-supply balance in the dry bulk market. As such, any shifts in production, capacity or exports, are of major interest to dry bulk ship owners. In a recent analysis, shipbroker Banchero Costa said that China currently accounts for around 52% of the world’s crude steel output. In 2018, world crude steel production amounted to 1,790 mln tonnes, up 4.5 percent compared to the volume in 2017. 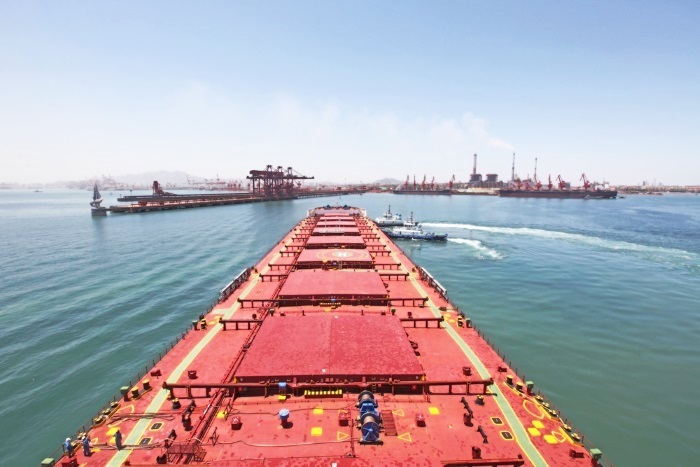 According to the shipbroker, Chinese steel demand is expected to be flat in 2019, but government stimulus could provide upside. “Chinese steel demand got a boost from a mini stimulus in real estate and the strong global economy. However, according to the World Steel Association (worldsteel), continued economic rebalancing efforts and toughening environmental regulations resulted in a deceleration of Chinese steel demand toward the end of 2018. This appears to be corroborated by data on the floor space of commercialized buildings sold in China – a leading indicator of market demand – which has slowed from previous years to a 1.3 percent increase in 2018, as lending to the real estate sector tightened. However, as a result of stimulus measures implemented by the government, new construction of real estate continued to pick up pace, as funding conditions and overall liquidity improved for real estate developers. As a result, growth in China’s finished steel products demand is expected to stay flat in 2019, although there could be some upside should the Chinese government implement stimulus measures”, said Banchero Costa. 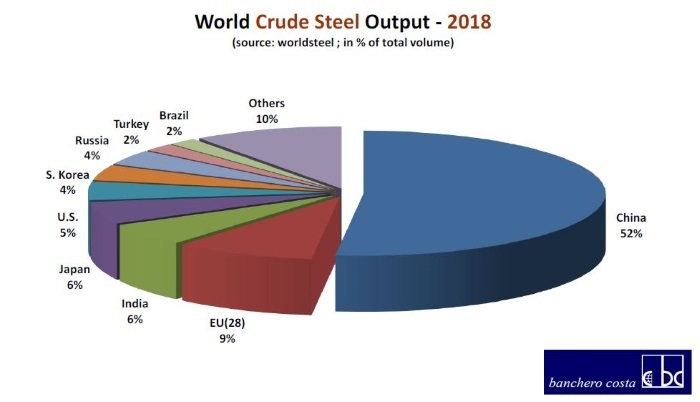 China currently accounts for around 52 percent of the world’s crude steel output, thus contributing significantly to any rise or fall in global steel output. In 2018, world crude steel production amounted to 1,790 mln tonnes, up 4.5 percent compared to the volume in 2017. Meanwhile, “China is expected to set a target of eliminating just 20 mln tonnes of steel capacity this year, after accomplishing its 2016-2020 target of 150 mln tonnes by last year, on top of removing around 140 mln tonnes of illegal low-grade steel capacity in 2017. The capacity reductions have played a key role in lifting profitability in the steel sector since 2016. Hebei, China’s largest steel producing province, has already announced its target of reducing steel capacity by 14 mln tonnes in 2019, compared to a reduction of 12.3 mln tonnes in 2018. Hebei had previously announced plans to cut around 40 million tonnes of steel capacity in some of its major cities from 2018 to 2020. However, capacity reductions are expected to play a smaller role in reforming China’s steel sector going forward, with the government focusing on shutting smaller steel mills, increasing the size of mills through mergers and acquisitions, encouraging mills to shift capacity away from population centres to coastal areas or even overseas locations, and ensuring blast furnaces are better equipped with pollution control technologies”. 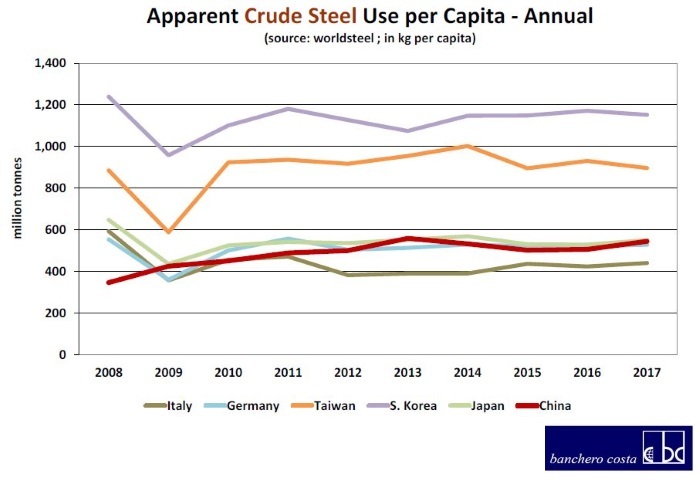 Crude steel consumption per capita in China was 545 kg in 2017, improving from 2015-2016, but still lower than a peak of 559 kg in 2013. Chinese consumption levels are now almost on par with Japan (550 kg), but remain significantly below South Korea (1,152 kg) and Taiwan (897 kg). Additionally, according to Banchero Costa, “China’s ongoing winter anti-pollution plan has allowed local authorities to adopt output curbs based on regional emission levels. This compares to blanket production cuts in 2017, when the government called on steel mills to cut output by 30-50 percent across four northern provinces during the peak winter heating months from November-March. However, there have been concerns that transferring the responsibility of production curbs to provincial rather than central officials has weakened enforcement. As a result, Chinese steel production volumes in November and December continued to increase by 17.3 percent and 13.5 percent year-on-year respectively. Steel prices also took a tumble towards the end of the year on concerns of a steel supply glut, while construction demand weakened in winter. Tangshan is now said to be considering extending output restrictions by six months, after looser restrictions failed to adequately control pollution this winter”. Chinese steel product exports in 2018 was 69.5 mln tonnes, down 8.1 percent year-on-year. The fall has largely been attributed to improved domestic demand, the shutdown of illegal steel production, and increasing protectionist measures by importing countries. Ongoing U.S.-China trade tensions have also negatively impacted the steel trade, especially as U.S. tariffs have a knock-on effect on other countries. Chinese steel export destinations are highly segmented. South Korea, Vietnam, and the Philippines are China’s largest export destinations, but account for only 10 percent, 10 percent, and 7 percent respectively of Chinese exports. 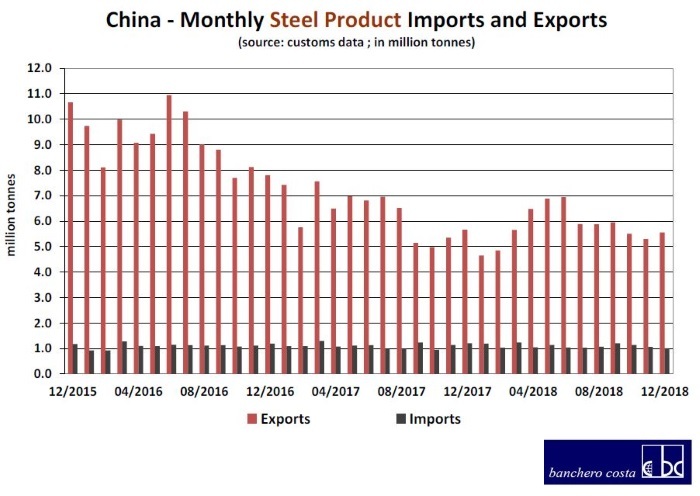 “Steel exports could rebound this year on lower domestic demand China’s steel product exports, which had helped to support China’s crude steel output in previous years as their domestic demand faltered, has been decreasing since 2016. After a fall of 30.6 percent in 2017, exports have continued to fall by 8.1 percent to 69.5 million tonnes in 2018. The lower export volumes has largely been attributed to improved domestic demand, the shutdown of illegal steel production, and increasing protectionist measures by importing countries. Ongoing U.S.-China trade tensions have also negatively impacted the steel trade, especially as U.S. tariffs have a knock-on effect on other countries which are steadily implementing retaliatory and safeguard measures. For example in January 2019, the European Commission revealed that EU member countries had approved final safeguard measures on steel in response to a surge in steel imports, and the measures would be implemented by 4 February and extend to July 2021. This follows provisional safeguard measures they had previously launched in July 2018, and are expected to come in the form of tariff-rate quotas, based on the average volume of imports over 2015-17 with an additional 5% added. Further steel imports above the quota would be subject to a 25% tariff, and major steel exporting countries would also face country-specific limits. In October 2018, Canada also imposed provisional safeguard measures on steel imports until April 2019, prompted by complaints from Canada’s steel industry that shipments of cheap steel were bring diverted to Canada from the U.S.. 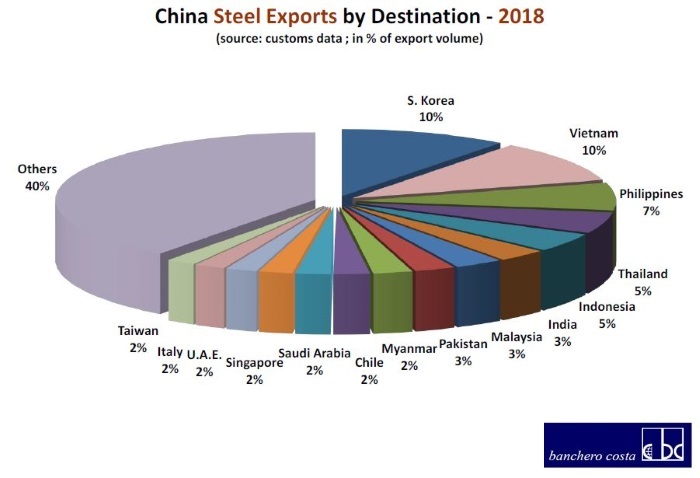 However, Chinese steel exports may possibly see some rebound this year, as lower domestic demand could result in more surplus steel available for overseas sales. While steel prices have slipped amid concerns of a steel supply glut and weakening construction demand, steel mills may still maintain output if they keep steel margins positive by switching back to cheaper low grade ores, and away from the more expensive higher grade ores and scrap usage”, Banchero Costa concluded.